Ultimaker 3 Review: A Dual Head Printer Worth the Money? This Ultimaker 3 review is about a prosumer dual extruder 3d printer with wireless control, operating on the FFF (fused filament fabrication) method. It is an industrial grade printer equally at home on the desktop as in the living room. It’s large build volume of 215x215x200mm ( 8.5×8.5×7.9in) defies the outer size, as it fits conveniently on your desktop. Outer dimensions 342x380x398mm( 13.5x15x15.5in). (The print volume drops slightly when in dual material mode to 197x215x200mm (7.75×8.5×7.9in). There is also an extended model with the Z axis extended up to 300mm. The printer comes with two print cores for build and support material. The customized nozzle geometry reduces the risk of clogging and give you a more reliable 3d print experience. 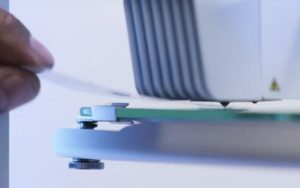 There is an integrated pcb on the print head to ensure a more accurate temperature control and superior print quality. 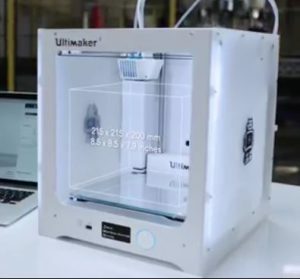 The ultimaker 3 can print at temperatures up to 280C, so the printer can print in a number of different materials. Fast print core changes mean fast up time and easier maintenance, there is nothing worse than a nozzle clog to annoy you when you are up against the clock to print something out. There are led lights within the print core housing to alert you to any user interaction required. For easy print removal and maintenance there is a removable glass plate. To remove the glass plate simply rotate the clips out of the way and remove towards the front. Make sure the glass is cold before removal. When using the glue stick for adhesion you will be soaking the glass plate and model in water to dissolve the glue. Levelling the build platform is effortless. When you use it for the first time, simply set the right height by turning the build platform height knob and inserting the supplied calibration card. After this the ultimaker’s built-in levelling routine does it automatically. The capacitive sensor in the print head measures the distance between the build platform and the nozzle. When starting a print the offset height is compensated for by adjusting the Z axis height in the first layers. This results in more accurate levelling, build platform adhesion and optimised print quality. 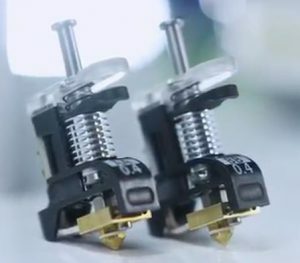 Installation of the correct materials for your model is simplicity, automatic recognition of the reels as they are placed on the printer allow, when connected, the CURA software to load the optimal profiles for quality printing. The recognition system is NFC built into the material carrier. If you are not using ultimaker material reels then you will need to enter the material manually. 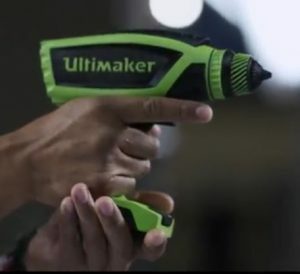 ultimakers range of materials are formulated to give you superior results and the open filament system allows you to experiment with all different types of materials. 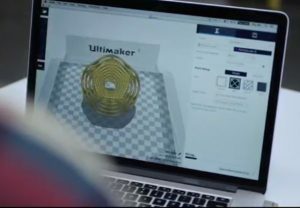 To bring your 3d model to life, you will need to prepare it for print using CURA, ultimakers free slicing software. You can stick with the presets for the materials or tinker with the advanced settings. You can print directly from your pc via the WIFI or LAN settings, alternatively you can load the gcode files onto a usb drive that slots into the front of the ultimaker 3. The control panel on the printer lets you make any adjustments during the print. The control panel allows updates to the software, when connected to the LAN. The ultimaker 3 is the most reliable durable dual extruder on the market. Combine two build materials for two colour 3d print or achieve state of the art complexity with build and water soluble support material. This allows you to approach your design process in a completely new way and create astoundingly complex designs. Ultimakers 3 unique nozzle lifting system ensures that there are no nozzle collision while printing and no problematic oozing. The powerful geared feeders ensure a more reliable result and superior print quality. The ultimaker3 features a build platform that is lighter and stiffer which reduces vibrations and produces an unrivalled print quality. With the heated glass plate you can print using many different materials and have improved build plate adhesion. Ultimaker 3 has a powerful triple fan system, featuring two new radial fans and fan shrouds. It creates greater airflow, this means better cooling, high quality bridging, faster print times and smoother surfaces. 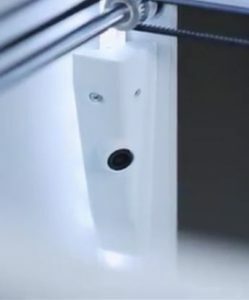 With the addition of the live camera, you can monitor every stage of your 3d printing project remotely, simply by connecting to WIFI. The ultimaker 3 has a large layer resolution of 20 to 200 microns. Which allows for remarkably detailed prints or superfast prototypes. Printing with pla and pva allows complex designs to be printed in place without any post printing assembly, using the water soluble pva as a support material. Pva can also be printed in dual extrusion with ultimker nylon, an ideal material for exceptionally strong functional prototypes. Using two build materials you can also produce dual colour prints for more realistic concept models. The ultimaker 3 comes with free lifetime technical support and warranty provided by certified experts worldwide. 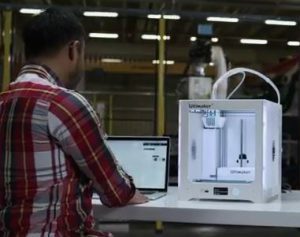 When you put it all together the ultimaker 3 is the most industrial grade desktop 3d printer on the market. With the price of the printer currently topping £3k, is it worth it? To get the features within the printer along with the ease of calibration. Your printer will be producing high quality prints time after time. So the ultimaker 3 review has shown it to be a very very capable printer from a good quality manufacturer. Have the whole 3D Printing process broken down into simple understandable elements. Gain an indepthunderstanding of how a 3d printer works, the different types and how to create a model to print. Every one has failures when 3d printing. The trick is to be able to diagnose what went wrong so it dosn’t happen again on this model. With this book you will be able to diagnose a lot of the failures and correct the problems, learning as you go. Do you want to go that one step further and create your own models? With this book you will learn the secrets behind one of the most used online 3d print cad modelling programs. Become an expert in no time. The 3d printing handbook shows you how 3d printing works. Every current type of 3d printing explained and how to design model for each type of printing process. 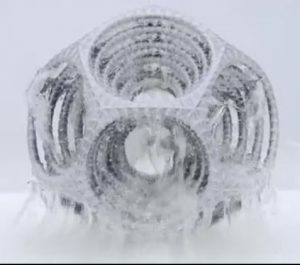 Written by three engineers from 3d hubs, the worlds largest network of manufacturing services founded in 2013, you know that the information contained within these pases will help you to understand the process of 3d printing. How can this site help you with your 3d printing? Best 3d printer is a site to help you get the most from your 3d printing. Whether you are a noob or more experienced, you will find tips and upgrades on this site to help improve your 3d printing. From modelling through slicing through printing through post processing, you will find information on this site to help you. I will concentrate on cartesian and delta DIY printers. I have two cartesians and one delta. A lot of the information will crossover to the pre-built printers, so feel free to browse the site. If you have a question which has not yet been asked why not use the contact me page so we can share the information. Anet A8 fan- do you want to hear the silence? Monoprice select mini 3d printer review – a printer for everyone? What is a 3d Printer and How Does it Work? 3d Printing : what questions should you ask? Anet A8 problems - Are They Real? 3d Printing Modeling Software : What are your choices for free? BL Touch sensor: An end to your manual bed levelling? Qidi Tech 3d Printer: The best starter printer? What is 3d printing technology? How Much does 3d Printing Cost? Ups for a 3d Printer: Do you need one? 3d Printer Belt Tension : Is it Important? Anet A8 Bed Leveling : How do You do Yours? Anet A8 Power Supply – Adding a Mains Socket. Why you need a multimeter if you have a 3d printer! Winbo super helper 3d printer range : A cheap introduction to 3d printing? What is the Zmorph 3d printer? More than just a printer! Anet A8 3d printer review – Should you buy this DIY 3d printer? Cooling nozzles for 3d Printers - What do you need? Make your audio sound as it should be heard. Why not Get Amazon Prime to save on shipping?